Spooky is for sissies. Amesbury Sports Park’s “Night of Frights” is a total scream that will have you looking over your shoulder and sleeping with the lights on for days. 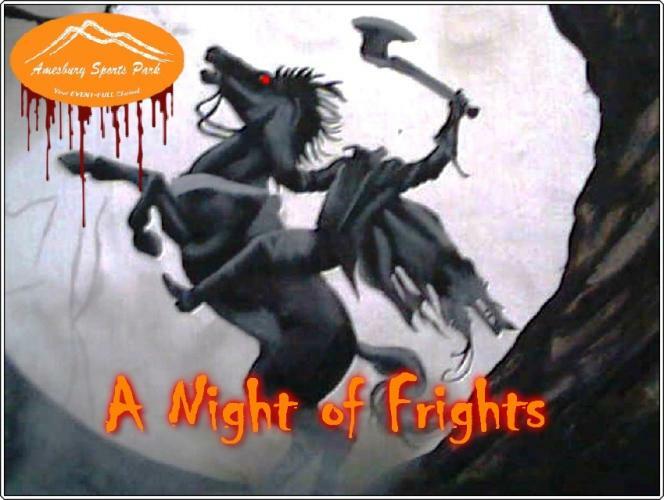 This Halloween, get scared silly at Night of Frights – a 3k obstacle race through the dark woods at Amesbury Sports Park. All you need is a headlamp, a buddy, and nerves of steel. Yes, you heard that right, headlamps, night time, woods. And that’s just the beginning. Add a host of ghosts hidden along the course, obstacles to conquer while trying to control your racing heart, and enough screeching and screaming to guarantee you’ll be totally freaked out and ASP’s Night of Frights will take the obstacle race trend for “Soccer Mom Bragging Rights” to a whole new level of glory. Skip the corn maze and haunted trails and come straight to this event - it will be the one annual Halloween event you won''t want to miss! Night of Frights 3k is untimed – because getting out of the woods and into the Purgatory Party is challenge enough. Survival is your reward. Too chicken race? Just party with us. We won’t tell anyone you didn’t have the nerve. Cold seasonal beer, music, a pig roast and bonfire, plus a “Dressed to Kill” costume contest and a chance to watch the brave of heart emerge from the scariest race in the country is reason enough to come out. And for $15, the price is far from scary. Wear a costume and get in for $10. Even less scary. The event takes place on Saturday, October 27th, 2012 at the Amesbury Sports Park at 12 South Hunt Rd. when the first wave of runners will charge up the steep hill and head into the haunted woods at 6:30 pm.